Heifer in Sacramento: Heifer International on NPR! The holiday gift giving season is difficult especially when you are buying things for kids and family members that already have everything! Seven years ago Jim Eckhardt came to this realization. Instead of giving each of his seven grandchildren gifts, Jim now donates a farm animal from Heifer International in honor of each child. NPR interviewed Jim and one of his granddaughters, Lydia, in this 5 minute story. The NPR clip also does an excellent job of describing Heifer International's strategy to end world hunger one community and one animal at a time. If you missed the live broadcast click on the title of this post and it will take you to the story (http://www.npr.org/blogs/thesalt/2011/12/16/143842712/with-alternative-giving-a-nudge-out-of-poverty-for-the-poor). Even if you missed the holiday gift giving season it is not too late. Consider giving Heifer animals as birthday gifts, baby shower gifts, and wedding gifts in 2012! 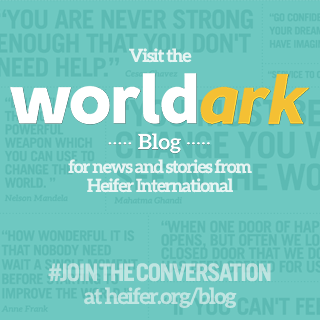 0 Response to "Heifer International on NPR!"